Slippers are light shoes which are easy to put on and take off and usually worn indoors. Some slippers are for indoor use only and others are multi purpose for indoor and outdoor enjoyment. Ruby slippers are slippers that are manufacturerd with rubies (plural for the ruby gemstone). Ruby is distinguished for its bright red color, being the most famed and fabled red gemstone. Beside for its bright color, it is a most desirable gem due to its hardness, durability, luster, and rarity. Transparent rubies of large sizes are more rare than diamonds. Did you know that a ruby is actually a sapphire? Yes, it is true. This type of gem is the exact same except for the color. Ruby is the red variety of the mineral Corundum. Sapphire, the other gem variety of Corundum, encompasses all colors of Corundum aside from red. In essence, Ruby is a red Sapphire, since Ruby and Sapphire are identical in all properties except for color. However, because of the special allure and historical significance, Ruby has always been classified as an individual gemstone, and is never identified as a form of Sapphire (though some purplish-red colors may straddle the line of being classified as either Ruby or Sapphire). The ruby slippers are the magic pair of shoes worn by Dorothy Gale as played by Judy Garland in the classic 1939 MGM musical movie The Wizard of Oz. Because of their iconic stature, the ruby slippers are now considered among the most treasured and valuable items of film memorabilia. As is customary for important props, a number of pairs were made for the film, though the exact number is unknown. Five pairs are known to have survived; one pair was stolen in August 2005 and has never been recovered. Why did Dorthy have ruby slippers? They were a gift from Glinda. Glinda the Good Witch of the North arrives via a magic bubble and shows Dorothy that the Wicked Witch of the East was wearing ruby slippers when Dorthy's home landed. When the Wicked Witch of the West shows up to claim her dead sister's shoes, Glinda magically transfers them to Dorothy's feet. Glinda tells Dorothy to keep tight inside of them and never take them off, as the slippers must be very powerful or the Wicked Witch would not want them so badly. How rare are ruby slippers? It is believed that at least six or seven pairs of the final design were made. According to producer Mervyn LeRoy, "We must have had five or ten pairs of those shoes". The wardrobe woman who worked on the film claimed "six identical pairs" had been made. Four pairs used in the movie have been accounted for. Rhys Thomas speculates that they were likely made by Joe Napoli of the Western Costume Company, and not all at once, but as the need arose. So, where are all the slippers? Did the Wiked Witch of the West want the slippers? Absolutely yes. These ruby slippers were super trendy as well as magical. Who wouldn't want them? Throughout the rest of Dorthy's time in Oz, the Wicked Witch schemes to obtain the shoes. When she captures Dorothy, she tries to remove the slippers from her feet, but learned the hard way they painfully shock her. She should have known not to mess with another women's shoes. Their are always consequences for messing with another fashionistas footwear. After The Wicked Witch realizes that the slippers will only come off if the wearer is dead, the plot thickens. Should Dorthy have returned the slippers to the Wicked Witch of the West when she asked for them? Since they belonged to her sister wouldn't they rightfully be hers? Was Dorthy a thief? 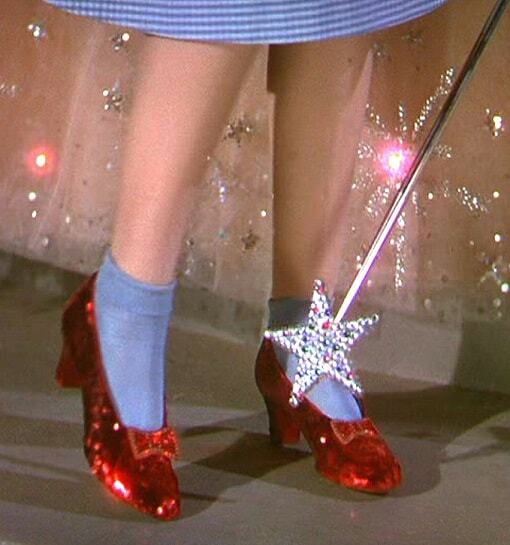 Why did Dorthy really have ruby slippers? In L. Frank Baum's original novel, The Wonderful Wizard of Oz (1900), on which the film is based, Dorothy wears Silver Shoes. However, the color of the shoes was changed to red in order to take full advantage of the new Technicolor film process being used in big-budget Hollywood films of that era. Film screenwriter Noel Langley is credited with the idea. What color are ruby slippers? Ruby slippers are red like rubies. Learn about other fascinating types of footwear. A moccasin is an outdoor slipper, made of moose skin or other soft leather, consisting of a sole (made with leather that has not been "worked") and sides made of one piece of leather, stitched together at the top, and sometimes with a vamp (additional panel of leather). The sole is soft and flexible and the upper part often is adorned with embroidery or beading. Though sometimes worn inside, it is chiefly intended for outdoor use, as in exploring wildernesses and running. As far as we know, moccasins are generally not made out of rubies. Don't you think that Dorthy should of had a pair of ruby moccasin slippers? We think they may have offered more confort and durability for her long journey. Yes, we understand that it was not her choice. 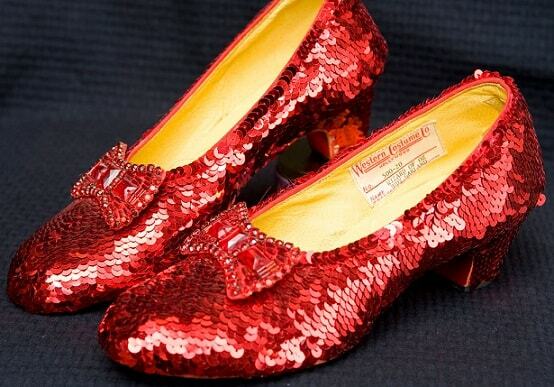 Who manufactured the ruby slippers used in the Wizard of Oz movie? The Western Costume Company in Hollywood claims to have made Garland's original slippers. While it is likely that Western would have been contracted to make some of The Wizard of Oz's many costumes, no records of the original slippers exist to either validate or disprove their claim. In 1989, to commemorate the movie's 50th anniversary, Western produced the only authorized reproductions. Hand-lasted on Judy Garland's original foot mold and completely sequined and jeweled, the reproduction slippers were nearly identical to the originals. Western planned a limited edition of 500 pairs at $5000 each, but halted the project after selling only 16 pairs. Are all ruby slipper magical? No, they are not all magical. Some are imitations or part of costumes. The Ruby Slippers were worn by Dorothy Gale, a character played by Judy Garland (1922–1969) in the MGM film, "Wizard of Oz," 1939. This fantasy tale about a journey to a magical land was based on the 1900 novel by L. Frank Baum (1856–1919); it had previously been a book, a cartoon, a stage musical, and several silent motion pictures before MGM created its hit film. In addition to its many other merits, the MGM movie ranks as a milestone in the history of Technicolor because of its extensive color sequences set in the Land of Oz. The ruby slippers at the Smithsonian. Click your heels three times when you want to go home. See the secret behind the shoes sparkle video. Learn more about the slippers at The National Museum of American History. You may want to also learn about glass slippers. Not as colorful but interesting as well.